Following the OSCE-wide Counter-Terrorism Conference, the Prevention Project convened representatives of civil society organizations (CSOs), as well as from the OSCE, the United Nations, and interested Participating States during a ‘civil society day’ on 25 May 2017 in Vienna. The purpose was to give CSOs and other local actors attending the OSCE Conference the opportunity to consider the issues on the agenda of the CT conference but primarily from the perspective of civil society and other community-level actors, and to put forward a series of recommendations for consideration by the OSCE Participating States, the OSCE, and CSOs for strengthening the role of civil society and communities in preventing and countering violent extremism and radicalization that lead to terrorism (P/CVERLT) in the OSCE region. The participating CSOs came from across the OSCE region, with expertise on and experience in a range of P/CVERLT issues, e.g., youth empowerment, community-law enforcement dialogues, rehabilitation and reintegration (R/R), religious engagement, research, gender, and democracy promotion. the importance of identifying and then replicating and/or up-scaling innovative, successful CSO-led P/CVERLT projects, while underscoring the need for more CSOs to be trained on how to incorporate a rigorous monitoring and evaluation (M&E) component in the project proposals and, more broadly, navigate the often burdensome application process for receiving donor funds. Throughout the day, participants put forward a number of practical recommendations related to deepening the contributions of civil society and communities more broadly in P/CVERLT. CSOs working on P/CVERLT need legal and political space, and security, to succeed: Providing legal and political space to facilitate CSOs engagement in P/CVERLT is indispensable. Yet it is also important to provide CSOs security support (as needed and if required), given that the space where they operate is rarely neutral and can be in continuous contention with existing fundamentalist organizations with radical/illiberal ideologies and agendas. Translations into local languages of more P/CVERLT resources (e.g. research, data, good practices, policy documents) for local CSOs and making them accessible on-line. There are very few relevant P/CVERLT materials currently available in languages other than English or French. Offering CSOs more opportunities to be trained on how to navigate the often cumbersome requirements for applying, let only complying, with donor funds. Providing tailored P/CVERLT training to CSOs who have experience in related fields (e.g. democracy promotion, women or youth empowerment, dialogue, human rights, peacebuilding, or community engagement). Building the capacity of range of professionals to better position them to be able to support P/CVERLT interventions (e.g. psychologists, social workers, teachers) and consider whether to establish a professional association around the P/CVERLT agenda to help evolve the currently ad hoc nature of P/CVERLT. Terminology matters: Be mindful of the sensitivities within civil society and communities around using terminology such as “CVE” or “VERLT”. These terms, like terrorism, can stigmatize communities and make them more reluctant to engage in a constructive dialogue with local authorities than if the dialogue was framed around more locally-rooted issues such as “community safety”. Establishing local security committees that include both law enforcement and community representatives, with the focus on issues of priority to the community. Trainings, workshops and dialogues that bring practitioners, law enforcement and civil society actors together at the local level and ones involving stakeholders from different countries together to learn from each other and see how other communities and countries approach these issues. The International Institute for Justice and the Rule of Law could provide a suitable venue for the latter exercise. Separating the community-engagement and CT and P/CVERLT functions of the police, with a dedicated group of officers assigned to each task; this requires additional training and other resources, which many police departments and law enforcement agencies may not have. Bringing law enforcement representatives outside of the traditional security environment and introducing them to alternative peacebuilding programs, such as arts and sports programs. Recognizing the negative impact that “democratic backsliding”, e.g., limiting of media freedom and restricting CSO space, can have on efforts to build trust at the local level. Overcome the obstacles to allow for more involvement of CSOs in R/R work: Disengagement, de-radicalization, and R/R of violent extremists are psycho-social processes and require the engagement and involvement of local communities, families, and social networks. Provide CSOs, where appropriate, with more access to prison environments and violent extremist offenders or suspects. Provide CSOs with the legal and political space, and security protections, to engage in R/R work. Learn from and build on existing (post-conflict) R/R/DDR frameworks and practices for R/R of violent extremist offenders (VEOs) and foreign terrorist fighters (FTFs). Focus more attention on the gender dimensions of R/R work: Develop gender-sensitive R/R and after-care programs and conduct specialized research on the role gender plays in both radicalization and recruitment and R/R processes. Don’t forget about the need to integrate non-violent extremists into society: For example, there is a need to upscale efforts to help children of non-violent Salafists, who have yet to commit a crime, integrate into society. Creating new or tailoring existing local, national and regional CSO networks for information-sharing, support and coordination of P/CVERLT efforts. These CSO networks should collaborate with other actors and sectors beyond civil society and governments as well as directly work with local communities and family members. Pursuing more coordinated CSO advocacy around P/CVERLT. Developing more locally-owned coalitions of CSOs with different areas of expertise to facilitate cross-fertilization among sectors. Strengthening connectivity between CSOs and academics working on P/CVERLT research, including through mechanisms that foster meaningful and sustained engagement/exchanges between academics, civil society practitioners and policy makers. Creating partnerships between CSO networks and religious communities to facilitate the involvement of community-level religious leaders to be at the forefront of P/CVERLT efforts. Focus more on identifying and supporting locally-rooted CSOs: Priority support should be given to CSOs/community-level actors working in the geographic locations and with the age groups that have shown a higher vulnerability to mobilization into violent extremism and by implication are faced with the challenge of integrating a higher number of returnees or convicted individuals into mainstream society. Support more rigorous and continuous research into the dynamics of violent extremism and the identification of geographic and demographic trends of radicalization, recruitment and mobilization is critical for successful P/CVERLT initiatives. Encourage CSO-private sector (beyond just the social media and technology sector) partnerships and put an emphasis on fundraising locally to support sustainability of P/CVERLT efforts. Ultimately, successful local fundraising is one of the most reliable indicators of the civil society efforts impact and relevance. Strengthen meaningful engagement with youth: Create more mechanisms to ensure that the voices of young people and youth-focused organizations are heard by policymakers throughout the policymaking and program development process. During the opening session the OSCE Chairman in Office Special Representative for Countering Radicalization and Violent Extremism, Professor Peter Neumann, highlighted three reasons why the involvement of civil society in P/CVERLT efforts is so important. First, when CT and P/CVERLT are run exclusively by national governments it can give rise to concerns that the space is being securitized and increase the risk that the response to the threat will not find the appropriate balance between “hard” and “soft” measures. Second, governments, which are often risk-averse and slow-moving, and reluctant to experiment, are sometimes not going to be the most effective actor, particularly when it comes to designing and implementing programs to counter violent extremist on-line propaganda and narratives. Third, and related, since what we are witnessing is largely a youth rebellion, often against governments, rather than an ideological movement, governments are not going to be the most effective actor to counter the violent extremist message when it is often governments that are responsible for generating the grievances that frustrate youth. The Special Representative posed two fundamental questions that need answering if we hope to see support for CSO-led P/CVERLT efforts grow. First, how can innovative CSO-led pilot P/CVERLT programs be replicated in other local contexts and scaled-up. Second, and related, how can CSOs become better about demonstrating success and, more broadly, how can we increase the number of CSOs that are adept at navigating the technical and bureaucratic process of raising funds from donors. The Austrian OSCE CiO underscored the importance the CiO is attaching to youth, in particular, during its chairmanship, highlighting how it has put youth on the frontlines of its work on P/CVERLT. It sponsored a series of youth-led and youth-focused workshops around the OSCE region over the past six months to develop recommendations for policymakers on how to more effectively P/CVERLT, including finding more ways to involve youth in P/CVERLT efforts. 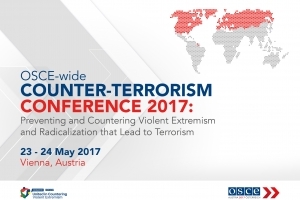 These recommendations were presented at the OSCE-wide Counter-Terrorism conference on 23-24 May 2017. Norway emphasized the positive role that CSOs play in P/CVERLT, underscoring that only with an active and engaged civil society can we achieve the “whole of society” approach to addressing the threat of violent extremism. It was pointed out, however, that CSOs are working under increasingly difficult conditions in a number of countries, which creates obstacles to their involvement in P/CVERLT. The Prevention Project’s Director, Eric Rosand, introduced participants to the Global Solutions Exchange (GSX), a new global civil society advocacy, collaboration, and analysis platform focused on P/CVERLT. Among its key objectives is to facilitate more sustained engagement between CSOs and governments and multilateral bodies around this agenda. To this end, under the umbrella of the GSX, the Prevention Project is convening civil society on the margins of key multilateral CT and P/CVERLT conferences to help ensure the different voices and perspectives from civil society and other local actors are heard in these settings and to facilitate increased cooperation among CSOs working on P/CVERLT. Participants discussed the relationship between law enforcement and CSOs and the broader community. They emphasized how trust between these stakeholders is perhaps the key ingredient for an effective local P/CVERLT program, but that trust is often lacking. It was pointed how trust-building requires constant facilitation and can only be developed over time. Participants noted the particular challenges associated with building such trust between law enforcement and human rights defenders, which requires both sides to be more willing to search for common ground to allow for constructive dialogue. They discussed how law enforcement is under pressure to reduce radicalization and prevent violent extremism, but that these efforts are only successful if civil society cooperates with law enforcement and the wider community. Yet, often trust is so fractured that civil society is reluctant to report incidents to police or security services. Participants shared examples of programs aimed at building such trust. One example from Central Asia involves a working group that includes 22 state and non-state actors and involves facilitated closed-door discussions with different stakeholders educating each other, was emphasized. Participants discussed the importance of taking law enforcement representatives outside of the traditional security environment and introducing them to alternative peacebuilding programs, such as arts and sports programs. It was pointed out that police should make an extra effort to change their approach to P/CVERLT, which, in some countries, currently emphasizes the opening and closing of cases, with promotions too often based on the number of cases that were closed. More emphasis, it was argued, should be placed on engaging with communities, with particular focus on working with women and youth. A long-standing community-policing good practice calls for separating the community-engagement and CT and P/CVERLT functions of the police, with a dedicated group of officers assigned to each task. It was noted, however, that the implementation of this practice requires additional training and other resources, which many police departments and law enforcement agencies may not have. In Central Asia, it was noted, while there is now increased awareness about VERLT, the overall approach to policing is not changing. Rather, there remains a strong belief that the security comes at the expense of human rights, even though rights violations of community members can fuel grievances that can drive violence. Participants highlighted other examples of efforts to build law enforcement-community trust, which include civil society participation, including in Kosovo (community safety fora) and Serbia (local safety councils). It was pointed out that to be effective, such local efforts need to prioritize addressing the real security concerns of the community. In some instances, it was noted that local government officials have used such meetings for electioneering or have had politicians misusing information shared by community members to pursue local political battles, thus undermining the very trust that the meetings were supposed to build. The point was also made that some governments tend to overpower CSOs in such local councils or any P/CVERLT working groups, leaving CSOs reluctant to engage as sometimes they are seen as providing legitimacy to the policies that are being imposed. Participants stressed the need for more resources to be invested in these local safety or security councils and in building the capacity of local CSOs to engage effectively in them. However, the larger point was made that too often politicians are impatient and prefer to invest in “fast food solutions and supply local police with new vehicles and CCTV cameras” rather than in the implementation of longer-term prevention strategies which could include supporting these councils. Participants underscored the sensitivities within civil society and communities around using terminology such as “CVE” or “VERLT”. These terms, like terrorism, can stigmatize communities and make them more reluctant to engage in a constructive dialogue with local authorities that if the dialogue was framed around more locally-rooted issues such as “community safety”. Participants also discussed the long-term requirements of “trust-building” and involving locally-rooted actors in such efforts and the challenges of building such trust when P/CVERLT programs are short-term and involve “parachuting” into local communities. The recent “democratic backsliding” in parts of the OSCE region was also highlighted as an impediment to trust-building. In this regard, participants noted the importance of protecting media freedoms and the space for CSOs to engage, and teaching critical thinking skills to young people as essential to strengthening the trust between communities and law enforcement. Participants discussed R/R strategies and programs, including the role of civil society and the wider community within these, highlighting the difficulties CSOs face accessing the prison environment, the reluctance of many governments to include CSOs in this area, the limited number of CSOs with expertise and capacity in this area, the safety risk that CSOs can face when they engage in this space, and the shrinking space for CSOs to work on P/CVERLT more broadly. Participants noted how radicalization and recruitment into violent extremism rarely happen in a vacuum or exclusively via social media. Rather, they are psychosocial processes that usually involve extensive engagement and interaction with particular segments of the community and social networks both in the physical and virtual space. Likewise disengagement, de-radicalization, and R/R of violent extremists are psychosocial processes. Therefore expectations of genuine progress in that direction would be unrealistic without a thorough engagement of local communities, families and social networks in these processes. Nevertheless, the point was made that it is important to be mindful of the continued existence within some communities of “spoilers” – sometimes in the form of CSOs – that are invested in a different kind of reintegration of violent extremist offenders, that within the structures of organizations espousing fundamentalist ideologies or have outright violent extremist agendas. Participants discussed the need for more research on radicalization and recruitment in prisons – with the causal links more assumed than proven – and how CSOs can help fill this need. In addition, CSOs can help conduct surveys of prisoners detained on terrorism offences, which may reveal useful information on motivations and drivers of violent extremism. CSOs can also facilitate the exchange of experiences, enabling practitioners from different countries and contexts to share best practices. Attention was drawn to the central role CSOs can play advocating for humane prison conditions (e.g. preventing overcrowding), which should be seen as a contribution to preventing radicalization. Promoting external oversight of prisons, and providing trainings on human rights-based prison management are other areas of potential engagement for CSOs. Participants noted the lack of gender-sensitive R/R and aftercare programs and drew attention to the need for specialized research on and work with children, youth and women in this area. Participants also stressed that while R/R, and deepening the involvement of CSOs in this work, is important, we should not forget about the need to scale up efforts to help children of Salafists integrate into society (e.g.. working in the pre-crime space). should be an indispensable component of any R/R work that involves civil society and the community. Participants stressed the importance of ensuring that mechanisms exist to allow for effective engagement and participation of youth in the democratic political process and/or to ensure the voices of young people and youth-focused organizations are heard by policymakers in discussions around VERLT and the design and implementation of policies and programs that aim to prevent and counter it. Participates lamented the paucity of such mechanisms. While underscoring the importance of ensuring critical thinking is included as part of the wider education curriculum for youth, participants emphasized the need to ensure youth learn how to use these skills. Participants stressed that governments need to invest more in providing positive alternative opportunities for young people, including youth/cultural centers, special youth after school programs and the importance of ensuring young people are included in the design and implementation phase of these efforts. The point was that made more P/CVERLT programs focused on “youth” should include those in the 12-18 age range. The point was also made that there is a lot of youth-focused work, e.g., focused on promoting critical thinking and media literacy, that is now being relabeled as “P/CVERLT”, without necessarily adjusting the methodology to take into account the different objectives of “P/CVERLT” programs. Questions were raised regarding the use of the “CVE” or “P/CVERLT” label in youth-focused programs, with some arguing that the label is often more appropriate for use only in the grant application, given the sensitivities of the term on the “end-user”. While there may be emerging consensus on the importance of “empowering” civil society in the context of P/CVERLT, the primary question is “how”? Participants explored what are some of the requirements for such empowerment: More funds? Less cumbersome grant application processes? Increased collaboration among CSOs? Having CSOs better demonstrate how they can help governments identify solutions to the challenges they are facing? Participants identified the need for CSOs to organize themselves better as a basis for more effective engagement with governments and politicians. Three reasons for limited cooperation among CSOs working in the P/CVERLT field were identified: a) limited availability of funding that leads to competition, b) different perspectives, which complicate finding a unified voice, and c) CSOs with limited relevant expertise chasing after (and often securing) P/CVERLT funds despite limited relevant expertise. It was noted that the lack of coordination among CSOs too often leaves CSOs doing the same thing (with key needs going unaddressed), albeit being funded by different (and sometimes even the same) donors. The point was also made that it isn’t sufficient for governments to engage with CSOs on this agenda at the end of the policymaking and program-design process. Rather, if one hopes to maximize the contributions of CSOs, governments should be encouraged to involve them throughout the process. For their part, CSOs should, where appropriate, be looking to produce solutions for policymakers and generate innovative ideas for programmers to “help them look good and otherwise promote their agenda.” This rather than being seen as primarily “asking governments for funding or other help” will incentivize governments to deepen their engagement with CSOs. Participants said that the multi-dimensional nature of the OSCE offered CSOs working on a range of P/CVERLT and P/CVERLT-relevant issues (e.g., human rights, media freedoms, good governance, and border management) a potentially useful platform for facilitating lesson-learning from and deeper cooperation among a cross-section of civil society actors. In this context, participants said that the new OSCE LIVE initiative, which identifies and coaches local actors who are new to P/CVERLT work, to take action against violent extremism, including by helping them understand the local context and what they can do to contribute to the field. Some advocated for the development of locally-owned, regional CSO collaboration platforms focused on P/CVERLT, including in the Western Balkans, which could facilitate more CSO-to-CSO cooperation (including joint projects and training and sharing of lessons learned, experience, and other information) and CSO advocacy. The point was made that as long as the focus remains on the transnational level, the perception that the agenda is Western-owned will linger, with local CSOs and community then not fully embracing an agenda that they might see as defined and imposed by external actors.” Participants agreed on the importance of developing locally-owned CSO coalitions and the use of more table-top exercises to help CSOs gain a better understanding of the practical ways they can contribute to P/CVERLT efforts. They also stressed the importance of ensuring that the relevant P/CVERLT materials, whether research, policy documents, or good practice guides or other tools are translated from English to French and vice versa, not to mention the local languages in the Western Balkans and Central Asia. The views expressed herein do not necessarily reflect those of all meeting participants, including the OSCE CiO and OSCE Secretariat, or all members of the Global Solutions Exchange Steering Group.